The trimmed string is stored in the variable result. As with the previous two blocks, the trimmed string is returned in the variable result. This would print each of the three items on a seperate line on the screen. All I am saying in the program is that I want to split the string wherever there is a comma. So how can we implement this in Scratch? Well, this is where lists come in to play. If we pass a string into our custom block and tell it to split on a space, each of the ‘sub-strings’ can be added to a list, and this is exactly how I have implemented the block. To call our custom block, we need to supply two parameters, the string we want to split and the character we want to split on. 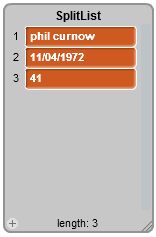 So, looking at the example below, we will pass in the string I like programming in Scratch and the second parameter, although looks blank, is a space. As you can see SPLIT is a very powerful and above all, useful block to have. Do you want to see anymore string blocks? 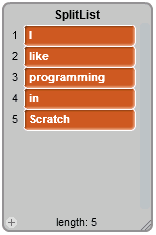 We now have several very useful custom blocks to manipulate strings in our Scratch projects. Are there any other blocks you would like to see for manipulating strings? If you can think of any other blocks, leave a comment on here or drop me a tweet and time permitting, I will see if I can implement it for you.